There are so many cute hair accessories in the stores now. The prices range from super cheap to out of this world expensive. I enjoy traveling to craft shows where home businesses sell their handmade goods. I’ve seen many takes on the crocheted headband. 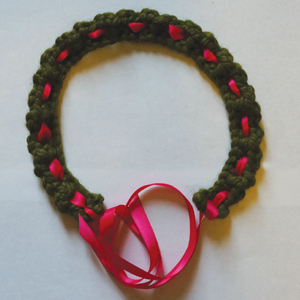 This pattern is my own twist by making lace and weaving a satin ribbon through it. 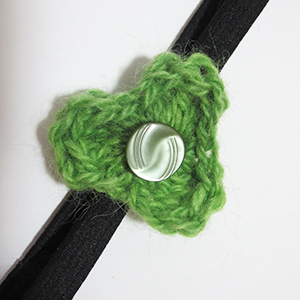 The ends of the ribbon work perfect for tying on the headband. 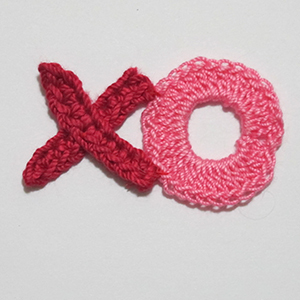 These crochet up ultra fast and are great for adults and kids alike. 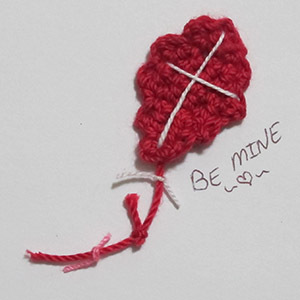 Make several while watching TV to sell at craft shows and bazaars in the spring! Our produce is finally starting to slow down in our massive gardens. Looking back, one of our most prolific crops was eggplant! It is one of my husband’s favorite vegetables. It takes a bit of creativity to come up with new recipes to use up our bountiful harvest. Thankfully he never seems to tire of the cooking experiments! This week, since I have so much inspiration around me, I decided to create this eggplant play food pattern just for the fun of it! It is a great scrap saver project. 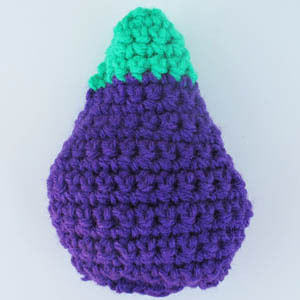 If you choose to use wool yarn you could even felt the eggplant. Have fun!